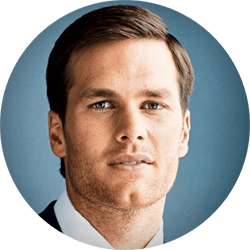 Thomas Edward Patrick Brady, Jr. was born on August 3, 1977 in San Mateo, California. After playing college football for the University of Michigan with victories in the Citrus Bowl (1999) and Orange Bowl (2000), he was drafted by the New England Patriots in the 6th round of the 2000 NFL draft. After fourteen years with the Patriots, Brady has appeared in the Pro Bowl ten times and been named the NFL MVP twice. Tom Brady has led the Patriots to six Super Bowls, winning four and being named Super Bowl MVP three times.